Cheryl Diane Kidder has a B.A. in Creative Writing from San Francisco State University. 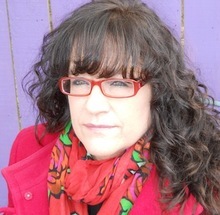 Her work, nominated five times for the Pushcart Prize, has appeared or is forthcoming in: CutThroat Magazine, Weber--The Contemporary West, Pembroke Magazine, Able Muse, decomP Magazine, Tinge Magazine, Brevity Magazine, Brain,Child, Identity Theory, In Posse Review, and elsewhere. For a full listing see: Truewest - http://cheryldkidder.blogspot.com. I write from dreams, notions, desires, films, what I'm reading, who I'm talking to, what I see in passing for 10 seconds while driving, old photos, pieces of quotes, daydreaming, looking into my daughter's eyes. Mary Gaitskill, Amy Bloom, Alice Walker, Cormac McCarthy, Aimee Bender, Charles Baxter, George Saunders, Joan Didion, Jean Rhys. Always reading. Favorites list continues to grow. Thanks so much, all, for reading and looking me up. The woman from the blog is Joan Didion. Thanks for looking me up! besides "Beds", i do also love your blog, cheryl...who is the woman in the post from Monday, November 30, 2009? Stumbled upon "A Ghost is Born" online. Amazing. You must log in to write on Cheryl Diane Kidder's wall.